Young children have no concept of height, and they have no idea of what will happen if they fall. For new parents and non-parents, this fact of life is totally mystifying and unexpected. But it is a fact of life, and it means that young children need constant supervision. Left to their own devices, any crawler or toddler will topple down the steps at the first opportunity. Both inside and outdoors, you have to pay constant attention to your child around stairs and ledges. You can never leave a child unsupervised anywhere near a staircase. If the child approaches the stairs from the top, he/she will end up falling to the bottom. If a child approaches from the bottom, chances are the child will try climbing the stairs. Any misstep along the way means the child falls. If the steps are made of brick, concrete, hardwood or metal, you can imaging the kind of injuries that a fall can cause. Windows pose the same threat. If you leave a window open and a child can reach it, a child will often climb right over the sill and fall. 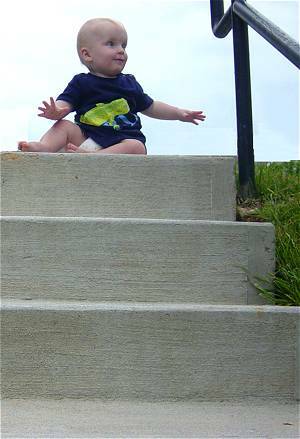 Careful parents NEVER leave a child unattended at the top or the bottom of a set of stairs, indoors or out. Inside, you should install child gates at the top and bottom of any staircase. Keep all windows within reach of children closed.